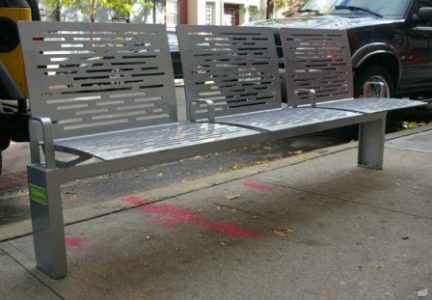 The CityBench Program was created to increase the amount of public seating on New York City Streets. The 1500 benches are being installed around the City, particularly at bus stops, retail corridors, and areas with high concentrations of seniors. The installation process of the benches will be complete in 2015 and has already made streets more comfortable for transit pedestrians, especially older adults. Details on older people's involvement: Older people provided the answers to our questions and surveys. They told us what they wanted. They were encouraged by our initiative. A few comments have been: "I don't know what I'd do without that bench! If it wasn't for that bench I couldn't get around. It's clean and thank God for it. I pray every day, please don't let it be full!" "The benches make a difference between a good day and a bad day." Yes. Expand from 3 neighborhoods to 10 neighborhoods to eventually all 51 neighborhoods. Our experience in conjunction with the City's New York City Parks Department was greatly received. Other than expanding funding, there were no restrictive challenges.